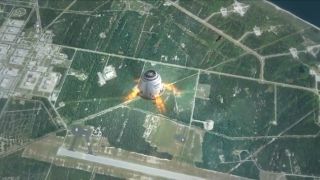 This still from a SpaceX video shows the company's Dragon space capsule firing thrusters during a powered descent as it aims for a vertical landing at its launch site. The plan is part of SpaceX's vision for a completely reusable rocket and spacecraft. The next version of the Dragon spacecraft built by the private spaceflight company SpaceX will look like something truly out of this world, according to Elon Musk, the company's billionaire founder and CEO. Musk detailed some of the high points of the firm's much-anticipated Dragon Version 2 to reporters today (March 28) during a briefing with NASA to celebrate the firm's second successful cargo mission to the International Space Station. SpaceX's unmanned Dragon capsule returned to Earth Tuesday (March 26) with a successful splashdown in the Pacific Ocean. But according to Musk, Dragon Version 2 landings won't be so … wet. But it may look weird. Those pop out legs, Musk added, will be for land touchdowns. Musk is designing the capsule in the hopes that it will make its landings back on Earth, not at sea. The current Dragon space capsule design can only land in water, but Musk said he wants to "push the envelope" with the spacecraft's next incarnation, be it for manned or unmanned flights. Musk is expected to unveil the design sometime later this year. Meanwhile, SpaceX is already experimenting with land landings using its Grasshopper rocket, a prototype for a completely reusable launch system that has made several test flights — each higher than the last — none of which were aimed at reaching space. Dragon isn't the only member of the SpaceX fleet getting an upgrade. The company's Falcon 9 rocket is also going to be retooled for more efficiency with 60 or 70 percent greater capacity and 60 percent more powerful thrusters, Musk added. SpaceX's most recent Dragon mission ended after three weeks attached to the orbiting laboratory. The capsule splashed downin the Pacific Ocean about 214 miles (344 kilometers) off the coast of Baja California to return about 2,670 pounds (1,210 kg) science gear and back to Earth. The Hawthorne, Calif.-based SpaceX has a $1.6 billion deal with NASA to fly a dozen cargo missions like the one that just ended. The company's fourth launch is scheduled for the end of September. During its mission, Dragon returned time-sensitive science experiments that were successfully delivered to NASA on time once it arrived on dry land, according to SpaceX president Gwynne Shotwell. Among the experiments were plants grown on station and new alloy mixtures that could help improve metal strength on the ground, International Space Station program scientist Julie Robinson said. NASA also has a commercial resupply contract with Orbital Sciences Corp., a $1.9 billion deal for at least eight unmanned cargo missions with the Virginia-based company's Antares rocket and Cygnus capsule. Orbital Sciences Corp. is on schedule to launch a test flight of its rocket in mid-April. The retirement of NASA's space shuttle fleet in 2011 leaves the space agency dependent on Russia's Soyuz spacecraft to ferry astronaut crews to and from the space station. Once private space taxis become available, NASA hopes to use them to launch American astronauts on trips to the station. SpaceX is one of four companies currently competing for the NASA crew launch contract. The manned version of SpaceX's capsule should carry seven astronauts into low-Earth orbit, and the company is scheduled to make another step towards the development of a crewed capsule later this year. NASA and SpaceX are planning to stage a "pad abort test" to gauge the functionality of the company's "launch abort system" that would need to be in place before a crewed mission can take place, Musk said.